A memorial service honoring the life of professor Rev. Mitsuo “Mits” Aoki will be held Saturday, Sept. 18, 2010 at Church of the Crossroads in Honolulu. 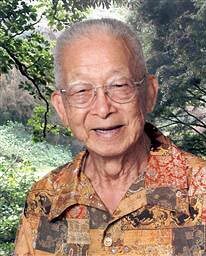 Aoki—who studied and taught about death and dying for many decades and counseled many through their final hours—died peacefully at his home in Kaneohe on Aug. 19, 2010, at age 95. Family, friends, and volunteers and staff from Hospice Hawaiʻi were with him during the time before his death. He “lived his dying,” experiencing the richness of each day, just as he had coached others to do for decades. Aoki spearheaded the establishment of the Department of Religion at UH Mānoa in 1956 and was instrumental in establishing Hospice Hawaiʻi in 1979. Thousands of students filled his classes on “The Meaning of Existence,” “World Religions,” and “Death and Dying” during the over 40 years he taught at UH Mānoa. Living Your Dying, a documentary about his work with terminally ill people and their families, has aired periodically on Hawaiʻi Public Television. More about his work and this film is online at livingyourdying.com. Aoki was also the founder and president of The Foundation for Holistic Healing, a nonprofit organization that aims to cultivate and promote a holistic approach to health and healing, death and dying. A graduate of Drury College in Springfield, Missouri, and Chicago Theological Seminary, he also attended UH Mānoa. He studied with Reinhold Niebuhr and Paul Tillich at Union Theological Seminary in New York City, where he researched and wrote about “The Meaning of Death” under the mentorship of Paul Tillich. The memorial service honoring the life of professor Rev. Mitsuo “Mits” Aoki will be held Saturday, Sept. 18, 2010 at Church of the Crossroads in Honolulu, 1212 University Avenue. Visitation with family will take place at 1 p.m., followed by the memorial service at 3 p.m. The service is open to the public and aloha attire is recommended. The Aoki family kindly asks that no flowers be given. Valet parking is available where the former Varsity Theater once stood, adjacent to the church. Overflow parking is at the Japanese Cultural Center and UH Mānoa’s Orvis Auditorium and Law School. Thank you for a lifetime of inspiration. I wonder why Aoki’s family asked for no flowers be given??? Sorry to hear of the passing of Rev. Aoki. He is one of the few professors that I had at UH that I still remember. I had him for his World Religions course back in 1966. I’ll never forget the day in class when one of the students challenged Rev. Aoki about the Catholic church, saying that “isn’t it just a religion of old women and children.” I am a Catholic, but the defense of the Catholic church that Rev. Aoki gave over the next 15 minutes was one of the best I have ever heard. Wish I had a tape recorder with me that day. Aloha and Mahalo Rev. Aoki. I did not Know that Reverend Aoki passed away….I was just thinking of him and how he taught me how to breathe…He was there to help when my mom was dying. I remember seeing him about a year or so ago at Longs Drugs in Windward Shopping Center (he was looking for batteries for his remote control…. He said, “Do you know how old I am now?” And I replied, “no, how old you now Reverend?”. Rev Aoki then said, “I’m 93 years old now! …and you know, what! ?”…and I said, “no, what?” and Reverend Aoki said, “AND I SURE FEEL like 93!”..My daughter and I just smiled and that was the last time I saw him. He was such a fun, calm, loving, caring gentle soul. I will miss him..He is truly an amazing man. One person that I will never forget. He has left a deep impression in my heart and mind! Aloha Reverend Aoki!